Rest of Today (Tuesday): Periodic showers / downpours. Gusty winds nearing 50 mph by the evening. Humid with highs in the 70s. Overnight Tuesday Night: Strong to severe storms with locally heavy rainfall & damaging wind gusts possible. Lows in the upper 60s. Tomorrow (Wednesday): Downpours, thunder. Windy Cape Cod. Highs in the 60s. Heavy downpours, embedded thunder, gusty/damaging winds are expected to persist and increase through the overnight hours as the line slides from west to east. Between 6 p.m. – midnight, that’s likely when we’ll see pulses of gusty downpours across the region. The cold front that’s spawning these heavy downpours will stall over New England, creating some localized flash flooding for this evening’s commute west, and spreading eastward creating a messy & wet early morning commute Wednesday, so pack the patience and expect a slow commute around the Boston-area, southern New Hampshire and into southern Maine. For Wednesday, we start to see the line of showers break apart and diminish in coverage across western New England, as the line of downpours continue to badger eastern New England. Potential rainfall totals between 2-4” possible through Thursday evening. 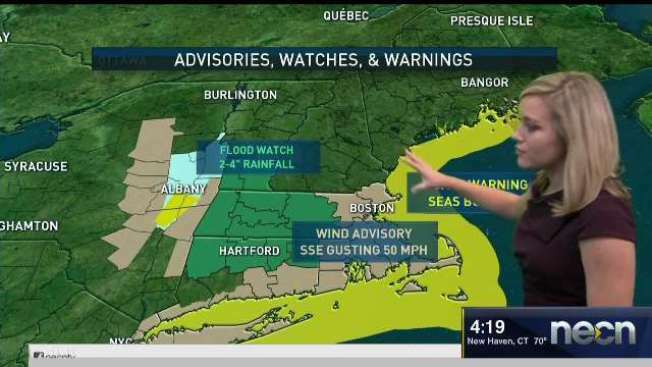 This has prompted a Flash Flood Watch for Massachusetts, Rhode Island, Northern Connecticut, Southern Vermont, which remains in effect through Wednesday late morning along with a Wind Advisory in southern New England as damaging winds have downed trees & power lines. Thursday still remains on the soggy side in eastern New England before this slow moving cold front finally clears off the coast. This weekend brings improving weather starting on Friday with partly sunny skies and highs into the 60s as we start to dry things out. The weekend brings highs into the 60s, late Sunday into Monday brings another system from the Great Lakes Region, which could bring another soaking rainfall. Thankfully, the rain is out of here just in time for Halloween, but cooler air settles in with highs into the 50s.